The migration of TechKB.onl to Azure was a relatively easy process. The first part involved creating a new WordPress website from a template in Azure and import the contents from the original blog site. The most complex part was assigning a custom domain name to the website. By default the Azure website is created as a subdomain to .azurewebsites.net so in the case of this blog techkb.azurewebsites.net. This isn’t ideal in the real world, so as you would expect, it is possible to assign a custom domain name . 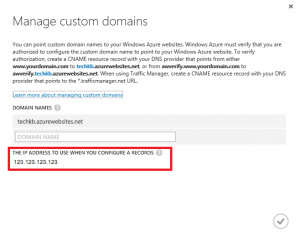 Add the custom domain name to your website from the Azure Portal. I wont be going into depth about purchasing your custom domain name as part of this post, but there are many Domain name registration sites out the such as 123-reg and godaddy and the process around choosing and purchasing one is pretty much generic across the board. 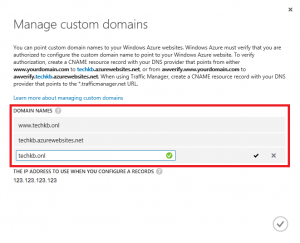 After acquiring your chosen domain name, the next step is to setup a couple of DNS records which will require knowing the virtual IP address of the Azure website. To find this open the Azure Portal, browse to the Websites tab, select your website then click on Dashboard. You should then have the option to click on Manage Domains on the bottom menu bar. NOTE: If this option is disabled, make sure you are using Shared, Basic, or Standard mode. 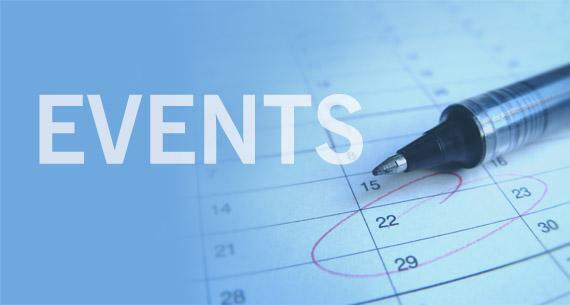 For more information, see How to scale websites. 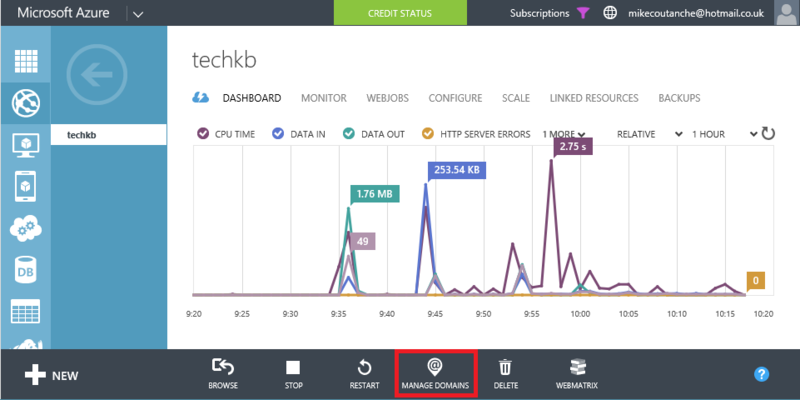 Clicking on the Manage Domains button opens a popup window which should have the virtual IP that is assigned to the website located at the bottom. Once a note of the virtual IP address has been made, two DNS records are required to get things working. Log in to your domain registrar and use their tool to add an A record and CNAME record. In many registrar tools, you will just type the subdomain portion of your domain, not the entire domain name. Also, many tools use ‘@’ to mean the root domain. 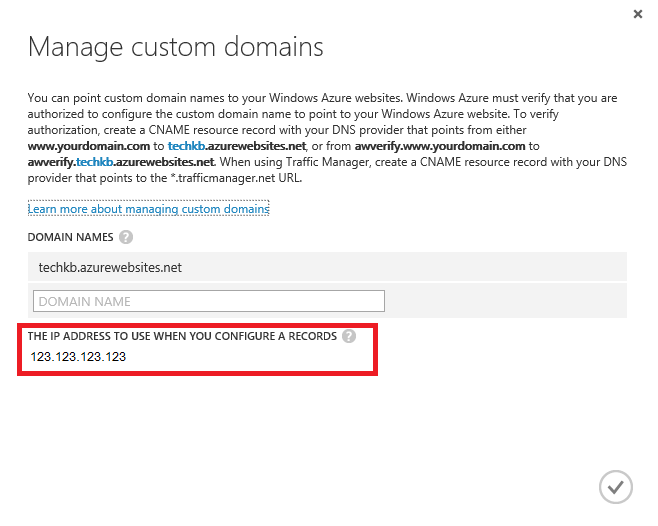 Create a CNAME record that maps from awverify.<yourdomain> to awverify.<yourwebsitename>.azurewebsites.net. For example, if the A record is for techkb.onl, create a CNAME record for awverify.techkb.onl. Create a CNAME record that maps from awverify.<subdomain> to awverify.<yourwebsitename>.azurewebsites.net. For example, if the A record is for blogs.techkb.onl, create a CNAME record for awverify.blogs.techkb.onl. Visitors to your site will not see the awverify subdomain; it’s only for Azure to verify your domain. 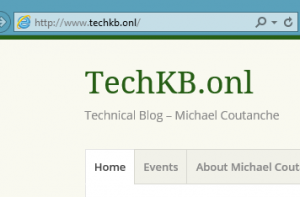 When migrating TechKb.onl to Azure Websites, a combination of both of the above methods have been adopted. 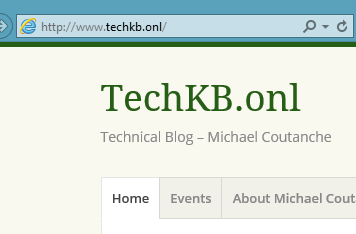 This makes it possible to browsing to the blog via techkb.onl or www.techkb.onl. 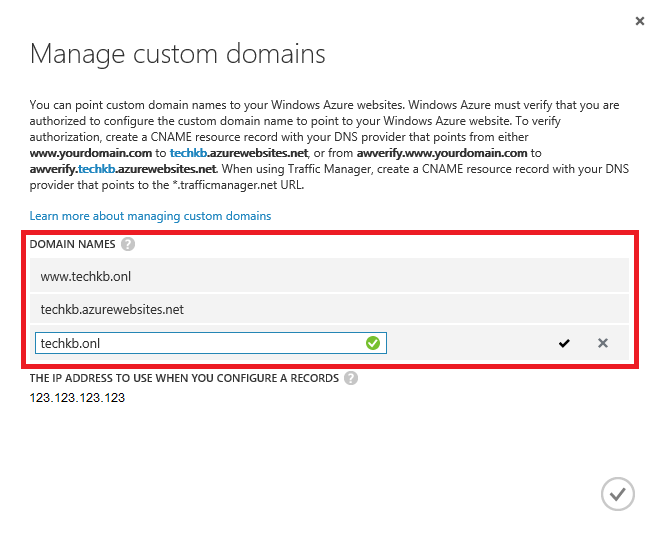 Once the relevant DNS records have been created, the final step is to add the custom domain names to your Azure website. To do this, go back to your Azure Management Portal. In the Websites tab, click the name of your site, select Dashboard, and then select Manage Domains from the bottom of the page. On the Manage custom domains popup window, enter your custom domain in the Domain Names text box and wait for it to be confirmed, then click the tick to assign the domain name to the website. If everything has gone well, it should be able to browse to the custom domain name and view the websites. One thing to note, is that it maybe necessary to adjust the general settings of the website to reflect the new domain name to allow the functionality of the site to work as expected.